With Rian Johnson inheriting characters and situations from J.J. Abrams, the movie breaks with Star Wars tradition and begins exactly where its predecessor left off. Although Johnson doesn’t mine Star Wars history as extensively as Abrams did to concoct his narrative, echoes and call-backs are inevitable and will be noticeable even to the casual viewer. If you’ve seen The Empire Strikes Back or Return of the Jedi, you’ll experience the occasional déjà vu moment. Perhaps that’s inevitable when approaching a franchise of this nature. Johnson, however, doesn’t play things as safe as Abrams and some of his story points are unexpected. In fact, he not only advances the overall narrative but brings it almost to a conclusion. There seems to be very little left for Episode IX to accomplish beyond tying up some loose ends. The Last Jedi is a film of moments. There are perhaps a half-dozen of them: goose-pimple inducing, fist-pump encouraging, heart-racing bursts of cinematic satisfaction. The problem is that the narrative threads connecting them are lazily knitted and sometimes tangled or broken. The overall plot is underwhelming and there’s far too much padding, especially during the first hour. There’s a sense that Johnson is giving busy-work to certain characters while others are catching up. The Last Jedi is a great 105-minute movie stretched too thin. Perhaps the most telling thing we’ve learned from The Force Awakens and The Last Jedi is that George Lucas was right with his 2005 claim (later reversed) that there wouldn’t be an Episode VII because there was no more story to tell. Filmmakers can bring back Han, Luke, and Leia but that doesn’t mean there’s a compelling narrative for them. Return of the Jedi, for all its faults, was a triumphant end to Luke’s journey, Anakin’s arc, and the Empire/Rebellion war. For this post-Lucas trilogy, the stakes seem smaller, the villains less intimidating, and the story too familiar. Every new movie gives us additional planets but, with the last two films, the far, far away galaxy seems to be shrinking. When we last left Luke Skywalker (Mark Hamill) and Rey (Daisy Ridley), they were standing atop a mountain sizing up each other. The latter was earnest as she held out a lightsaber to its rightful owner. The former looked peeved, probably because it had taken the whole of The Search for Luke Skywalker to get to him and the moment passed without a line of dialogue. Well, in The Last Jedi, Luke speaks and much of what he has to say isn’t happy or inspirational. He may look like Obi-Wan in A New Hope, but he’s not much interested in teaching Rey or returning with her to play the role of heroic icon. And he’s not as lonely on the isolated planet as it initially seems. He has all sorts of CGI-created friends, including the penguin-like porgs, which ended up in a Star Wars movie on their way to a Pixar film. Has there ever been a more annoyingly cute, merchandise-friendly creature? Oh, yeah: Ewoks. While Luke and Rey are playing their game of will-he-won’t-he-train-her, the Resistance is in trouble. Apparently, there aren’t many ships left in the fleet and, after the First Order catches them fleeing their latest hidden base, there are destined to be fewer of them. Still, ex-Princess-now-General Leia (Carrie Fisher in her final performance) is nothing if not determined. When hotshot pilot Poe Dameron (Oscar Isaac) disobeys an order, it results in massive losses in service of a major victory. But the Resistance is trapped and the end appears nigh, especially when Supreme Leader Snoke (Andy Serkis, doing his usual motion-capture thing) shows up in person to confer with his minions, Kylo Ren (Adam Driver) and General Hux (a frothing-at-the-mouth Domhnall Gleeson). Meanwhile, back with the Resistance, injured hero Finn (John Boyega) wakes up and embarks on a filler quest accompanied by newcomer Rose Tico (Kelly Marie Tran) and R2-D2 knock-off BB8. Without question, the best scenes in The Last Jedi feature Mark Hamill and, being a fan of old, Johnson makes sure that Luke is given his due. He’s not a secondary player thrown onto the screen to stoke the fires of nostalgia. He has a major part to play in the way things evolve and nothing that Johnson accomplishes over the course of this movie undoes any of Luke’s monumental legacy. The yin-yang between Kylo Ren and Rey represents one of the more intriguing elements of The Last Jedi – it’s a concrete embodiment of the Dark Side/Light Side conflict that we haven’t previously seen in the movies and offers the possibility of differing paths existing for each character. Rey hints at seeing a future in which Ren stands with the forces of Light; conversely, Ren envisions a darker road for Rey. Meanwhile, Luke is haunted by his perceived failings and all these years later, he still grapples with his own impure tendencies. When The Last Jedi focuses on these characters and their stories, it’s on solid ground. Prior to hearing Mark Hamill’s first words as Luke in 34 years, we are treated to an impressively rendered space battle. This pits the Resistance’s few remaining fighters against the First Order’s more impressive fleet in a desperate attempt to destroy the newest weapon in the villains’ arsenal: the mini-Death Star-esque Dreadnaught. From a technical standpoint, the sequence recalls the opening fight of Revenge of the Sith, where Anakin and Obi-Wan lead a mission to rescue Palpatine from Dooku. As an easily-digestible piece of pop culture, The Last Jedi does its job even if it takes longer than is necessary to do it. But nothing about Star Wars is ever that simple because every frame gets studied, parsed, and dissected by a passionate fandom. Will The Last Jedi be like Revenge of the Sith, which received a lukewarm reception upon release but has gained in respect over the years? 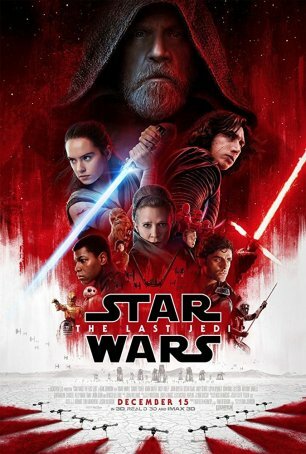 Or perhaps The Force Awakens, which was loved far and wide in December 2015 but has seen a dramatic reversal in opinion during the two years since it debuted? Or perhaps something else? The reason to see The Last Jedi (not that anyone needs one beyond the Star Wars moniker) is for those half-dozen moments I mentioned above. There’s enough verve and artistry here to tip my thumb skyward and avoid the tomato from going rotten. But I’ll admit to having been disappointed by aspects of the scope and scale of the narrative, especially considering the high regard in which I hold Johnson (his Looper was my #1 film of 2012).